Sharing Saturday is still open if you would like to share your child-oriented crafts and activities or be inspired by the amazing ones already shared! 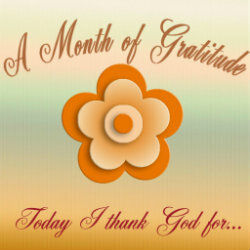 Today I thank God for a week with very few plans so hopefully I can get the rest I need! 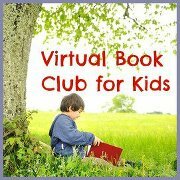 Today is the kick off of November's Virtual Book Club for Kids Blog Hop. As you may know I have joined a wonderful group of bloggers to do this book club. Each month we feature an author and each of us picks a book to blog about and do some craft or activity with it. Then we invite you to join us by choosing a book by the author of the month and sharing in our blog hop. I join the following wonderful blogs to bring this to you each month. This month's author is Tomie dePaolo. Now he has many books to choose from that appeal to different ages. This week we will talk about two of his books. Angels, Angels Everywhere is a sweet little book for younger children. It goes through each page with different angels and they are labeled things like "Kitchen Angel" or "Play Angel". You can guess from the pictures what their role is as well. 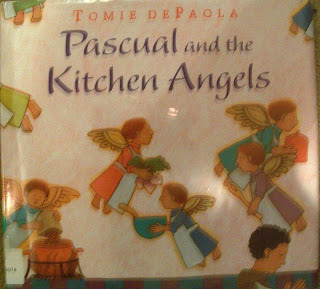 Pascual and the Kitchen Angels is a book telling the life of Pascual, the patron saint of the kitchen. Pascual goes to a monastery to join the monks, but when the monks see all the food he brings from his family they ask him to cook. Not wanting to be sent away he goes to the kitchen and begins to pray since poor Pascual does not know how to cook or for that matter boil water. The angels come and cook while Pascual prays and prepare a wonderful feast. The monks are so impressed with his cooking they make Pascual their cook. Since both of these books involve angels, we are sharing both of them today. For Pascual and the Kitchen Angels, we made wooden spoon kitchen angels. I bought some wooden spoons at the Dollar Tree. We put a googly eye on each and then used felt for hair, dress and wings and a pipe cleaner for the halos. This craft can also work for Angels, Angels Everywhere since it also mentions kitchen angels. We also made some lollipop angels. We are still working on using up our Halloween candy! 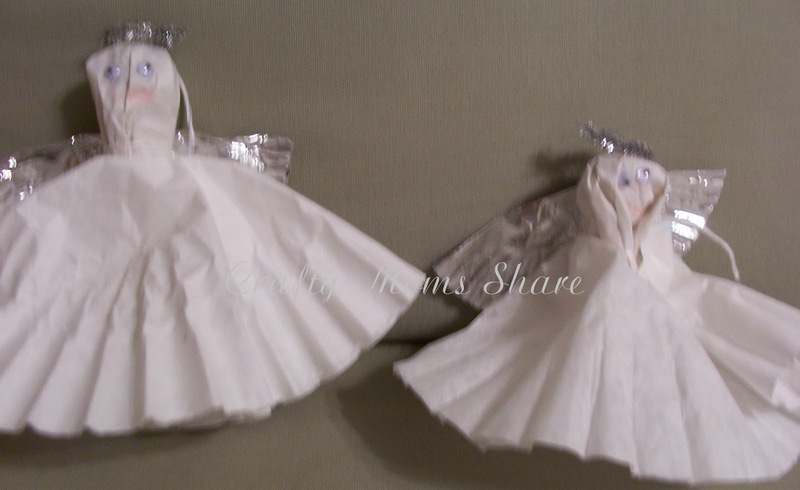 For these we used tissue paper, coffee filter dresses, cupcake liners (for wings) and pipe cleaner halos. Then we made some paper plate angels. I think these are pretty self explanatory. Then after Hazel went to bed, I made her an angel mobile. In Angels, Angels Everywhere we talk about the Bedtime Angel who tucks the children into bed and we always add that she stays and keeps them safe so they are not alone. I thought it would be fun to have a mobile of angels with one representing the Bedtime Angel. I put three angels on it to represent the Bedtime Angel, the Wake Up Angel, and the Guarding Angel. My plan is to hang it above Hazel's bed so she will see the angels looking over her each night. 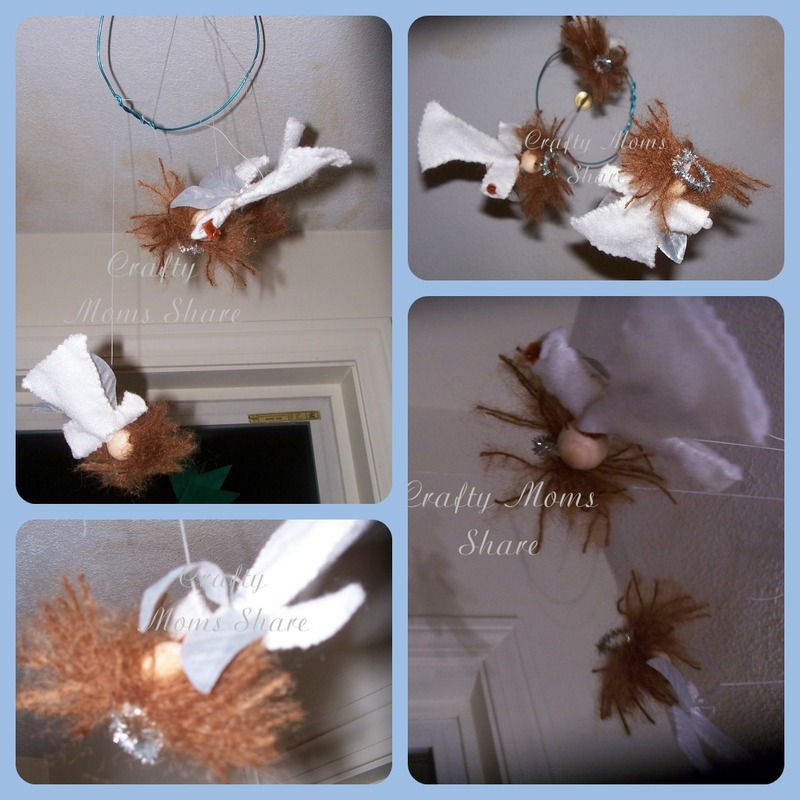 These angels are made with a pipe cleaner, wooden bead, scraps of yarn and felt for clothes. I used the pipe cleaner halo and a I cut a silver poinsettia I got at the Dollar Tree for wings. Then I strung them and hung them on a circle of floral wire. My balance is not perfect yet, but I will work on it. For even more angel crafts you can check out all the ones we did last year for the angel swap we participated in. Every time we read Angels, Angels Everywhere Hazel tells me she really likes it! What Tomie dePaola books have you been reading lately? I hope you will join us in our blog hop! 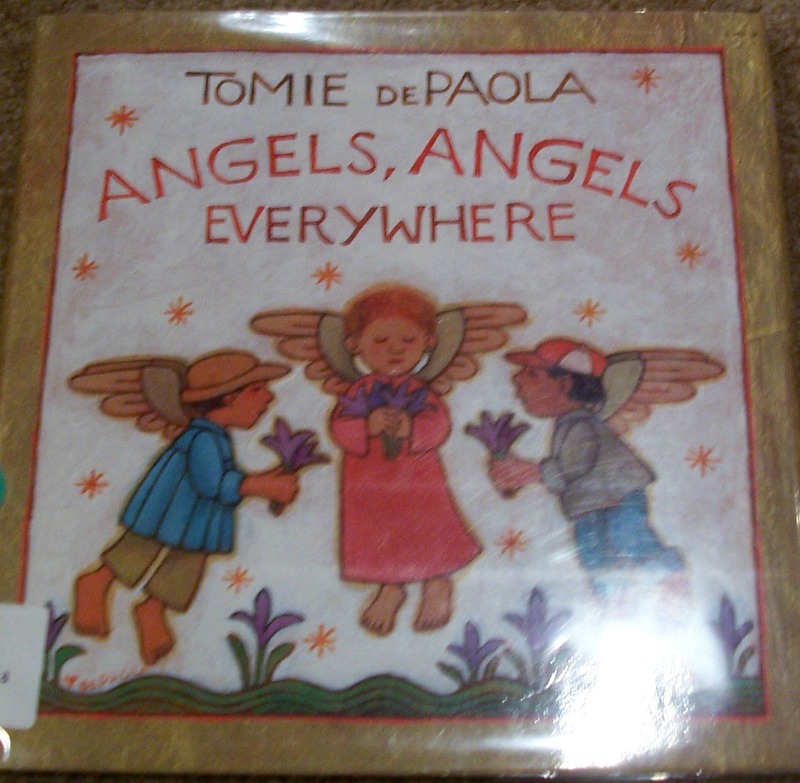 Next week we will be sharing another Tomie dePaola book and craft/activity. I hope you will join us again! I love all of your angels. 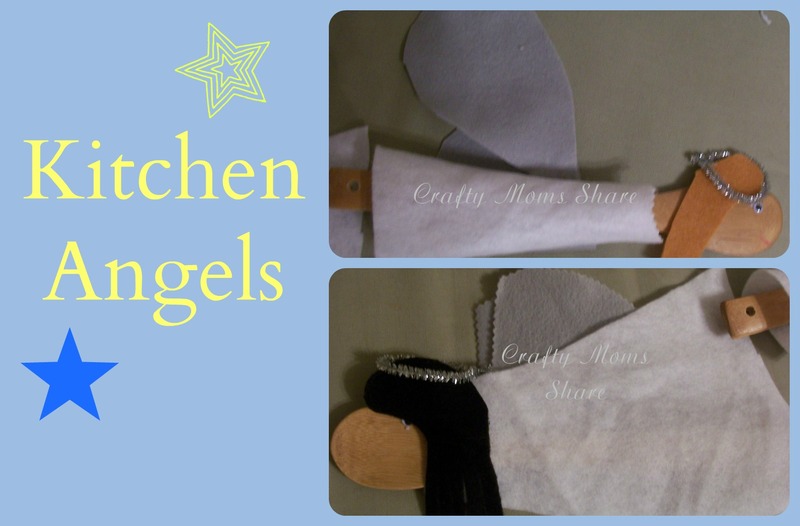 The wooden spoon angels are particularly sweet! Love these sweet little angels. Glad you linked up at "I Gotta Try That" Have a great Thanksgiving! Those are sweet. I'm visiting from the Nov Virtual Blog Hop.